In recognition of National Breast Cancer Awareness Month, CSK participated in the Susan G. Komen Race for the Cure, the world’s largest fundraising event for breast cancer, on Saturday October 15th. In addition to raising significant funds and awareness, the 5K run also celebrates breast cancer survivorship and honors those who have lost their battle with the disease. 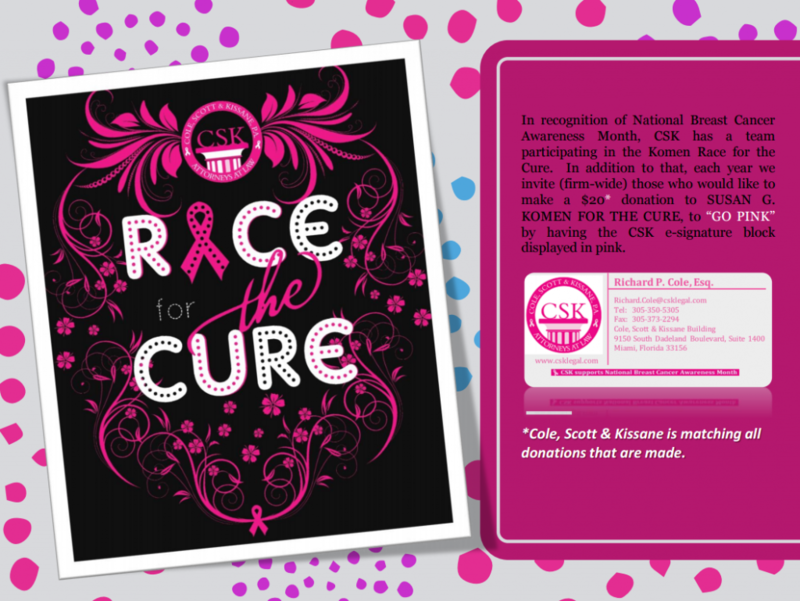 CSK will also be holding its annual GO PINK campaign firm-wide where members of our team are invited to make a $20 donation to Susan G. Komen for the Cure and to spread awareness by “Going Pink” in their CSK e-signature block. The firm will match all donations made by our team. Learn more about the organization’s fundraising efforts at komen.org.